One day a really good Goldsmith biography will come out that doesn’t cast him as genius or buffoon. Norma Clark’s ‘Brothers of the Quill’ came closest but wasn’t a biography as such, more a recontextualising of his life within the parameters of an Irish immigrant writer. Until then, collections like Balderston’s one of Goldsmith letters are essential. It doesn’t matter that most of the interesting letters are copied word for word into those dodgy biographies, nor that the lesser known ones are mainly thank-you or begging notes, it’s important that they stand alone for the reader to pour over and make decisions about Goldsmith’s character. The main conclusion seems to be that he wasn’t quite as letter happy as the rest of his contemporaries. Johnson’s fill shelves, Walpole’s fill bookcases - Goldsmith’s barely fill a slim volume. A volume that is bulked out with a brief biography and appendices featuring forged letters and a retrospective of him by his sister. To make any judgements on Goldsmith based on these paltry works is difficult, but even in his letters he has a habit of making juicy little nuggets. My favourite quote ‘ I shall laugh at the absurdities of the world - and at myself, the most ridiculous one in it’ comes from a letter. His awareness (and playfulness) around his ugly face is one his most pleasing characteristics. To the author of the Goldsmith biography that pictures him as unfeeling, it’s clear that he does have warmth to some members of his family but a distinct coldness to others. It’s not that he couldn’t feel strong feelings for people, more that he didn’t often. And when he did…he didn’t write many letters. It is clear from things Reynolds have written, that theirs was an extraordinarily strong, yet very quiet relationship that was conducted in person rather then in letter. These letters show how warm and yet how exclusive those relationships were - he’ll be mates with everyone, but only few people will reach that special level. 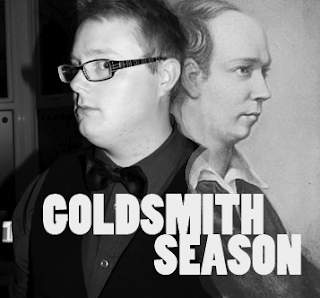 I have to say that I feel, as I often do, a certain sympathy with Goldsmith. Were I to become a great writer and were historians to ransack my emails and texts, I’m sure they’d discover little that shows the warmth of my relationships or the variety of my connections and communications. Someone reading my texts would find me a very cold person indeed, this is because my awkward fingers aren’t happy manipulating a phone and my messages are terse. I’d need a Boswell available to capture how I really am with my friends - Goldsmith had a Boswell around, but a Boswell who didn’t understand him at all. Poor Goldsmith, he has so little to recommend or explain him but his works, including those few letters, so we have to be thankful for them.